“Truth, which is not organized, can be readily defeated by evil that is,” said LibForAll co-founder and former Indonesian President H.E. Kyai Haji Abdurrahman Wahid, in explaining the need for organized efforts to expose and counter extremist ideology and movements not only in Indonesia, but worldwide. 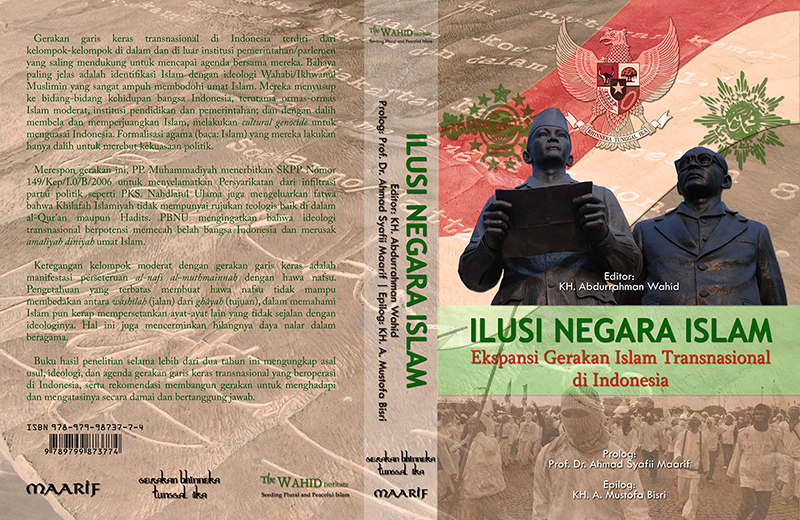 On April 2, 2009, on the eve of the Indonesian national legislative elections, influential Muslim leaders who form the backbone of LibForAll Foundation announced the publication of the Indonesian-language book Ilusi Negara Islam (The Illusion of an Islamic State: The Expansion of Transnational Islamist Movements in Indonesia). 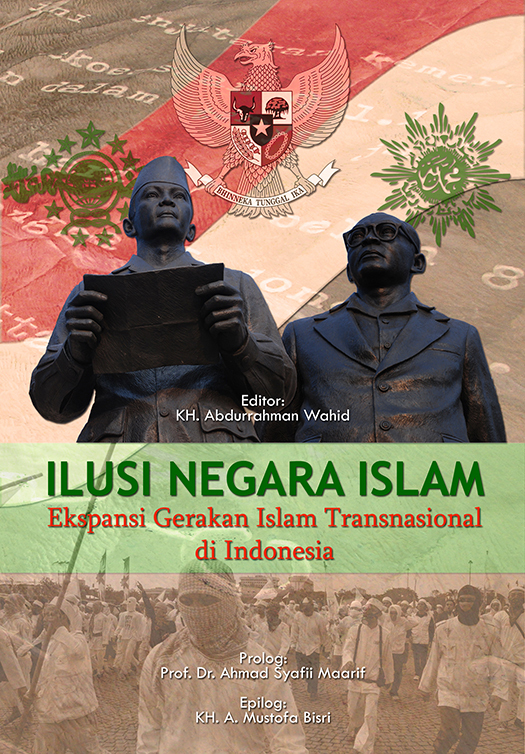 The cover shows a statue of Indonesian founding fathers Soekarno and Muhammad Hatta, proclaiming the nation’s independence on 17 August, 1945 – establishing the new nation as a multi-religious and pluralistic state, while explicitly rejecting calls for an Islamic State. Background text on the front and back covers is the actual text of the Independence proclamation, signed by Soekarno and Hatta. Red and white are the colors of the Indonesian flag. Green symbol to the left, above Soekarno’s shoulder (featuring nine stars and an image of the globe) is that of the Nahdlatul Ulama – the world’s largest Muslim organization, with over 50 million followers. Symbol to the right (above Muhammad Hatta’s shoulder) is that of the Muhammadiyah, the world’s second-largest Muslim organization. Members of the extremist group Front for the Defense of Islam depicted “beneath the feet” of Indonesia’s founding fathers, Soekarno/Hatta. “Extremist transnational organizations in Indonesia consist of groups that operate both within and outside the institutions of government, and mutually support one another in pursuit of a common agenda. The clear and present danger they pose stems from their identification of Islam with Wahhabi/Muslim Brotherhood ideology, which is extremely virulent and effective at deceiving the Muslim community at large. Extremists are systematically infiltrating all sectors of Indonesian society, especially moderate Islamic mass organizations, educational institutions and the government. Under the pretext of defending and promoting Islam, they are waging cultural genocide, in order to dominate and rule Indonesia. Their efforts to formalize religion (i.e., Islam) are merely a pretext for their true agenda, which is the seizure of political power. “In response to these radical movements, the Muhammadiyah Central Board published Muhammadiyah Central Board Decree Number 149/Kep/I.0/B/2006, to save the organization from infiltration by extremist political parties such as the Muslim-Brotherhood-affiliated PKS. The Nahdlatul Ulama has also issued fatwas declaring that an Islamic Caliphate has no theological basis, either in the Qur’an or the sayings of the Prophet Muhammad. The NU Central Board has further issued public warnings that transnational extremist ideology has the potential to rip Indonesia apart, and destroy the Muslim community’s own practice of religion. “This conflict between moderate Islamic organizations and radical movements is a manifestation of the struggle between al-nafs al-muthmainnah (tranquil souls devoted to God) and those dominated by passion and self-interest. A shallow and limited knowledge of Islam prevents those dominated by ego and passion (i.e., the radicals) from distinguishing between washilah (the path) and ghâyah (the goal), and causes them to demonize Qur’anic verses that do not conform to their own ideology. Such behavior reflects the loss of all reasoning ability in the field of religion. 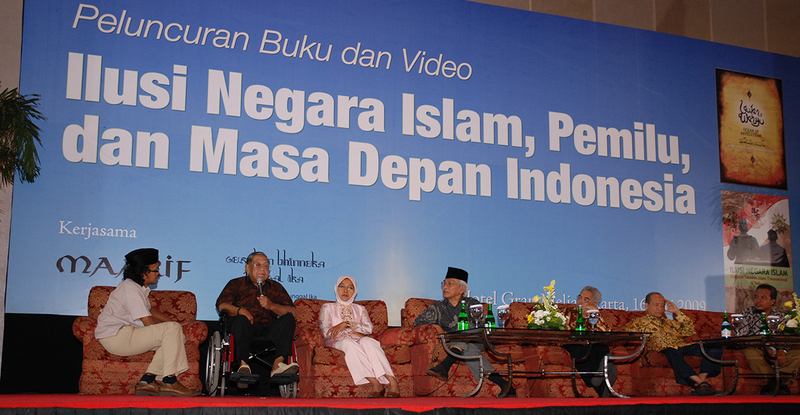 President Abdurrahman Wahid edited The Illusion of an Islamic State, which includes contributions from LibForAll advisors Kyai Haji Mustofa Bisri, renowned leader of the 50-million-member Nahdlatul Ulama, and Dr. Syafii Maarif, immediate past chairman of the 30-million-member Muhammadiyah and a 2008 recipient of the Ramon Magsaysay Award, Asia’s equivalent of the Nobel Prize. 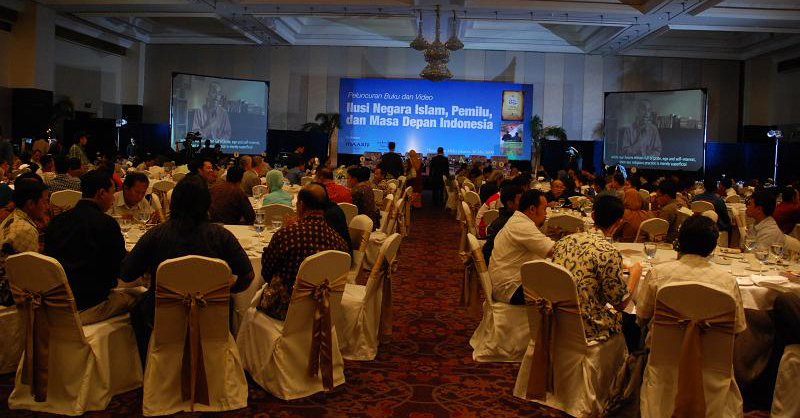 These prominent Muslim leaders announced the book to the Indonesian elite and the international media on April 2, 2009, and officially introduced it to the Indonesian public at a high-profile event (see below) on May 16th in Jakarta. The exposé ignited a nationwide firestorm of controversy following its official launch, and remained a major news story for many weeks. As one indicator of the massive press coverage, Indonesia’s largest internet news site—with 10.5 million visitors a day—carried six separate stories about The Illusion of an Islamic State and the intense public debate surrounding it. The Illusion of an Islamic State also went viral on the Internet, with over 600,000 copies downloaded in less than a month. 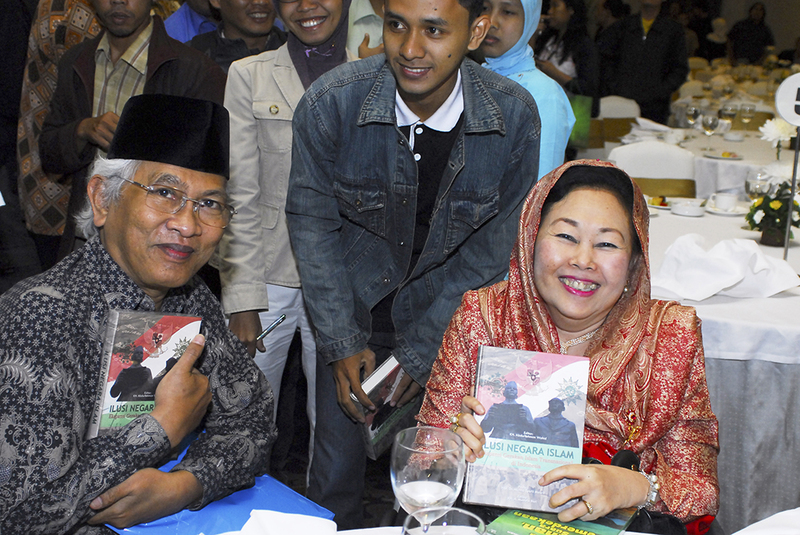 Scores of websites, including the main sites of the 50-million-member Nahdlatul Ulama and its 10-million-member youth movement, GP Ansor, posted electronic copies of the book online, while a Google search specifically targeting the book’s title, “Ilusi Negara Islam,” went from virtually zero to over 550,000 results within two weeks. Many extremists also read the book and declared themselves “terrorized” by the overwhelming public rejection of Wahhabi/Muslim Brotherhood ideology triggered by publication of The Illusion of an Islamic State. “The [Muslim Brotherhood-affiliated] PKS has accused the authors of The Illusion of an Islamic State: The Expansion of Transnational Islamist Movements to Indonesia of being agents of former American President George W. Bush. But the various researchers involved in the book take said accusations in stride, and joke about them. “If people don’t like [the book], it’s natural they would talk that way. But of course it’s not true,” said the leader of the Yogyakarta team of researchers for the book, Abdul Munir Mulkhan, while speaking with INILAH.COM in Jakarta on the 8th of April. Foreign columnist Bret Stephens of the Wall Street Journal described Dr. Munir’s successful efforts to expel the PKS from the Muhammadiyah in an article entitled “The Exorcist” (left). LibForAll co-founders H.E. Kyai Haji Abdurrahman Wahid and C. Holland Taylor meeting with former Muhammadiyah Chairman A. Syafii Maarif (right) and renowned Nahdlatul Ulama leader A. Mustofa Bisri (second from left) to establish the Bhinneka Tunggal Ika (Oneness Amid Diversity) Movement, whose objective is to mobilize Indonesia’s elite, and general public, to preserve the nation’s traditions of religious pluralism, tolerance and diversity, while simultaneously developing the institutions of good governance and the rule of law. 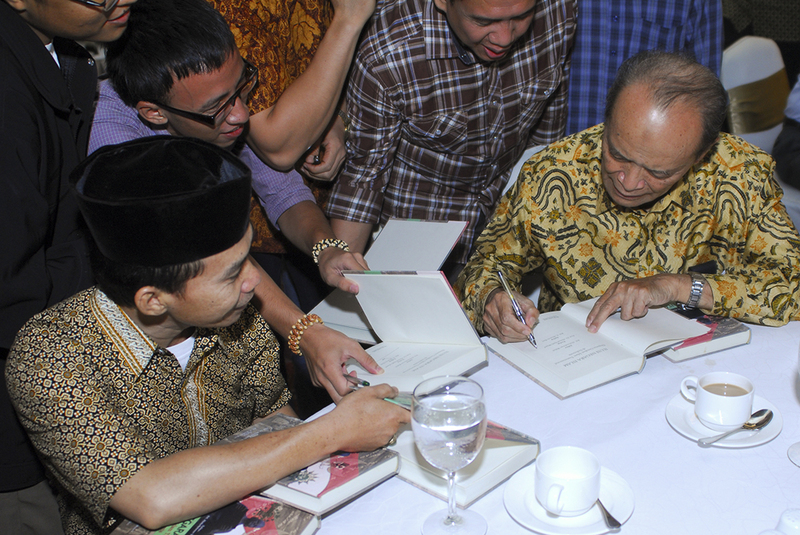 Approximately 40 members of the Indonesian print and broadcast media attended the book and video launch on the evening of May 16th in Jakarta, and news of the book quickly went “viral” in the nation’s mass media and on the internet. 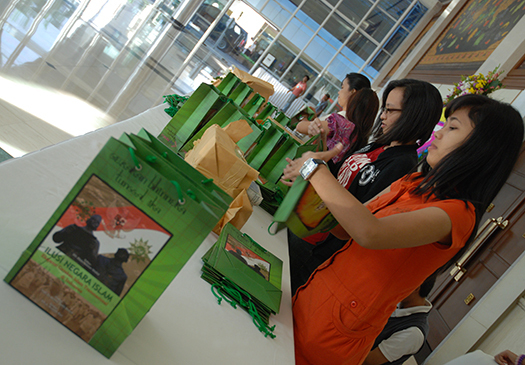 Volunteers (left) prepare copies of The Illusion of an Islamic State and excerpts from the video series for members of the press. 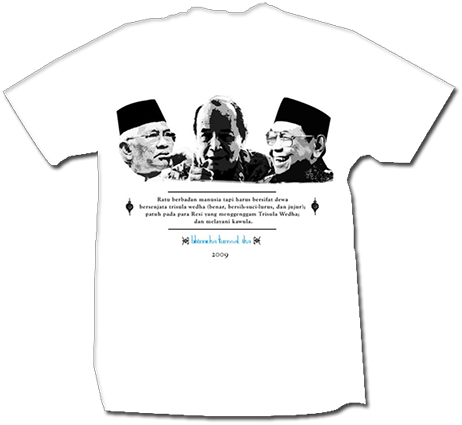 Journalists also received Bhinneka Tunggal Ika Movement t-shirts featuring the organization’s spiritual leaders (resi, in Old Javanese) and slogans associated with each of them. Entrance to the launch venue, as the first guests arrived. More than 300 guests attended the event, including key leaders in the fields of religion, education, government, military, business, entertainment and the mass media. 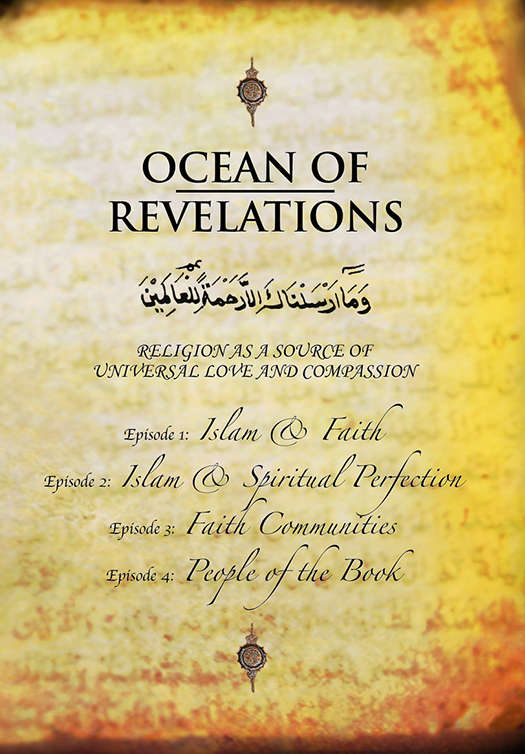 Dinner was accompanied by the first public screening of LibForAll’s film series, Ocean of Revelations: Understanding Islam as a Blessing for All Creation. Executive Director of The Wahid Institute, Ahmad Suaedy (at podium), welcomed guests to the event. 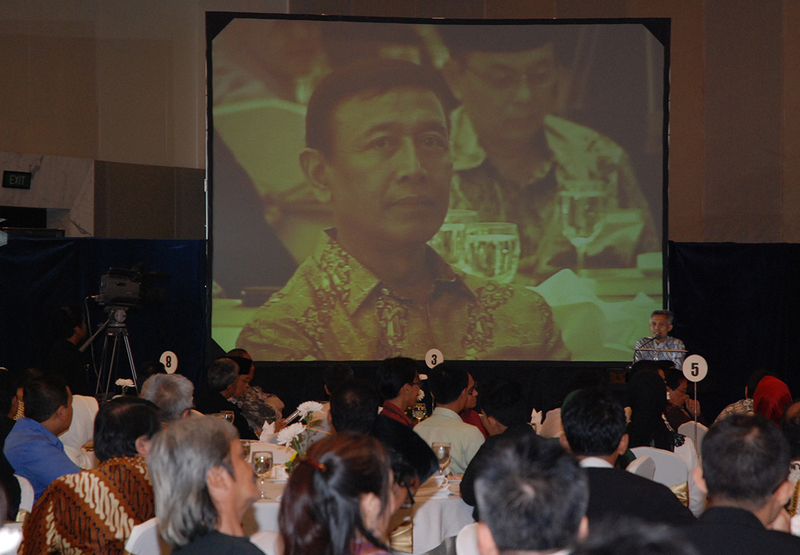 Guests included former commander of the Indonesian armed forces, General Wiranto (seated in audience/pictured on screen), who was in the midst of running for Vice President in Indonesia’s national elections. 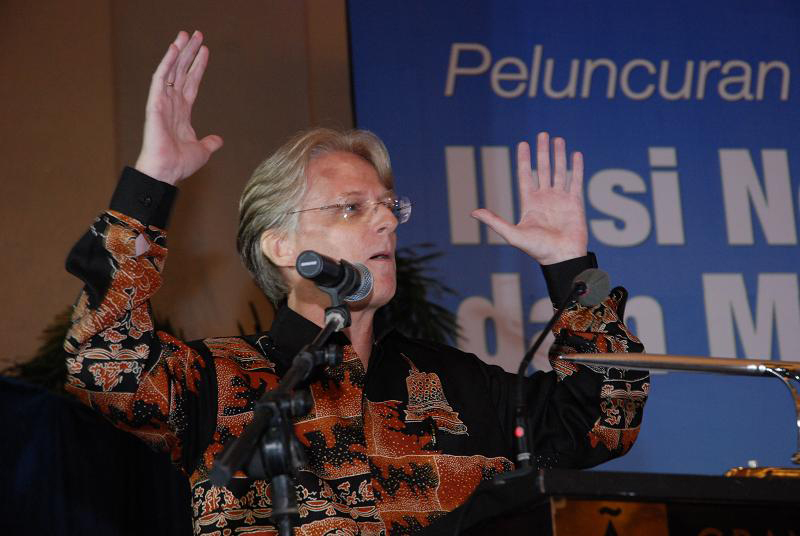 LibForAll Chairman and CEO, C. Holland Taylor, described the vital role that Indonesia and its religious leaders can play in helping to overcome the “crisis of misunderstanding” about Islam which threatens humanity. 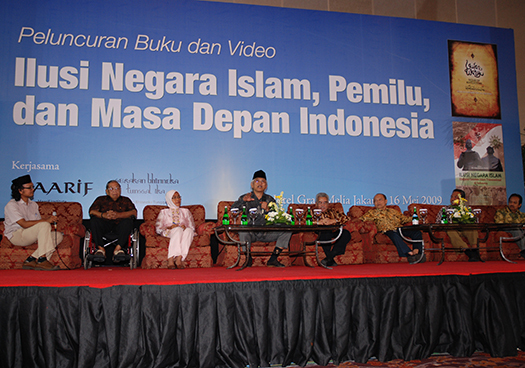 Guntur Romli (far left) led a panel discussion on the threat of extremist infiltration of Indonesian society, with speakers that included, from left to right, former President Wahid; Dr. Maria Ulfa, Chairwoman of Fatayat NU, or the Women’s Branch of the Nahdlatul Ulama; KH. Mustofa Bisri; Muhammadiyah leader and National Human Rights Commissioner, Dr. Abdul Munir Mulkhan, who headed the project’s field research; senior Muhammadiyah statesman Dr. Syafii Maarif; Kyai Haji Ghozalie Said, Chairman of the Nahdlatul Ulama’s Bahtsul Masa’il, or law-making body; and Dr. Abdul Kadir Ahmad, head of the South Sulawesi chapter of the NU. “People who are convinced that they know more than anyone else about Islam, and yet are full of hatred towards any of God’s creatures who do not travel the same path as they; and those who claim to be in possession of the absolute truth, and for that reason entitled to act as God’s vice-regents on earth (caliphs) and to dictate how everyone else must live—clearly, their words and behavior will not lead us into the presence of God. Their dream of an Islamic state is merely an illusion, for the true islamic state is not to be found in the structure of any government, but rather, in hearts which are open to God and all His creatures. 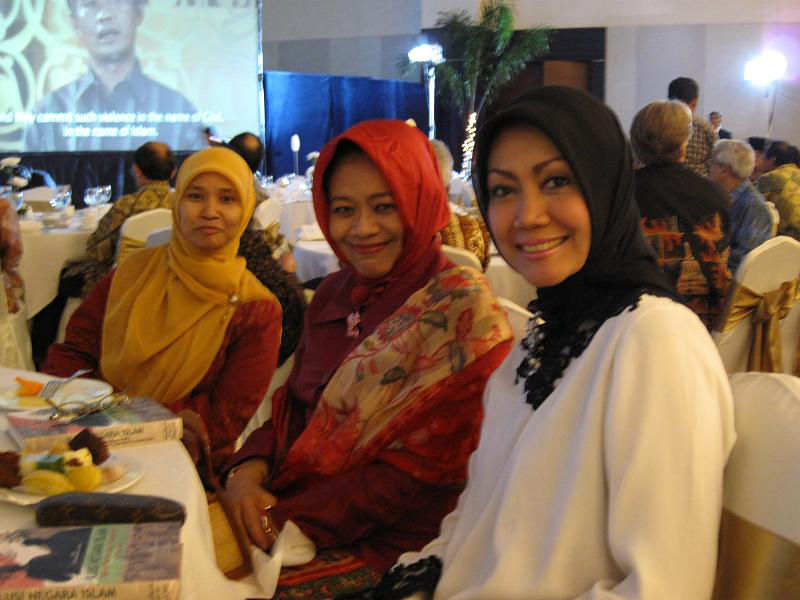 Guests of honor included NU activist Dr. Siti Musdah Mulia (center, in red) and top model and film celebrity Okky Asokawati (right). “The shari’a we know today is the result of ijtihad, or centuries-old human reasoning, and thus it is time-bound. Consequently, a huge project such as creating an Islamic state is extremely difficult, if not impossible, without rethinking the very basis of our ideas about shari’a. Journalists interviewing Kyai Haji Mustofa Bisri following the event. 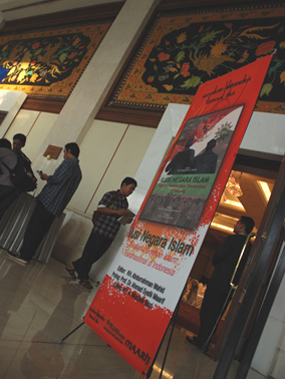 The Illusion of an Islamic State quickly became the most controversial and widely-discussed book in Indonesia, attracting massive praise and support from Indonesia’s mainstream Muslim community and condemnation from extremists. The Wahid Institute strives for a just and peaceful world by espousing a moderate and tolerant view of Islam and working towards welfare for all. 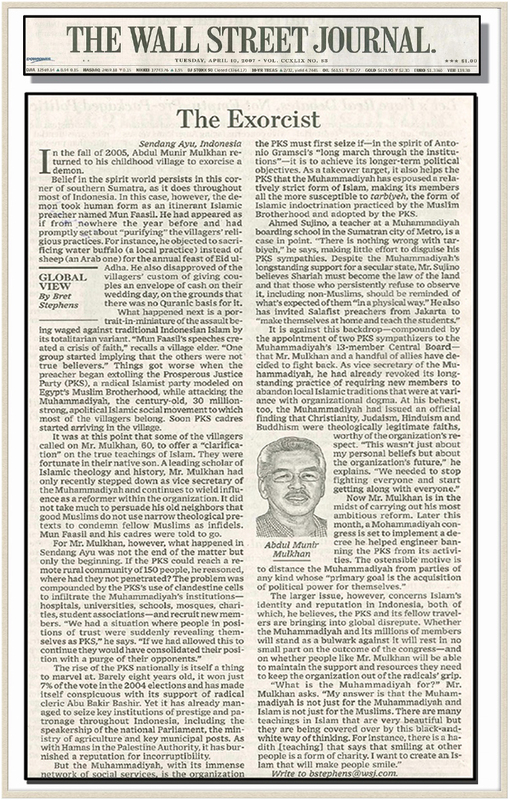 The Wahid Institute seeks to expand the vision and intellectual principles of H.E. 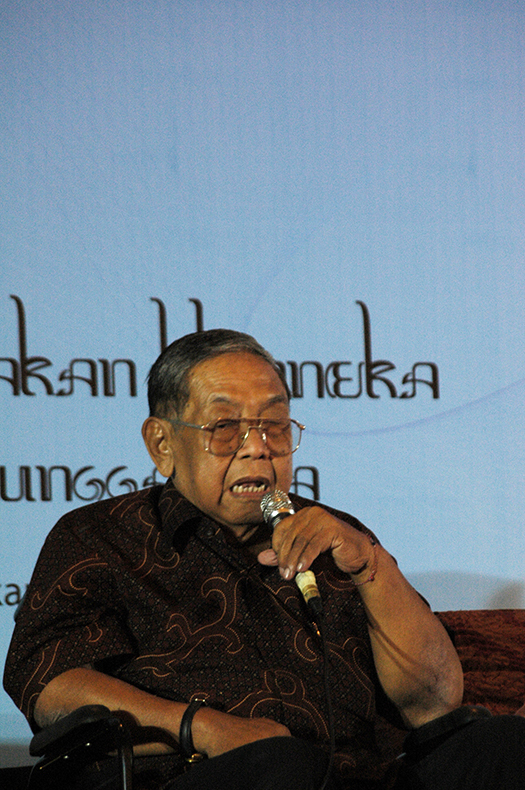 Abdurrahman Wahid (Gus Dur), former President of Indonesia and world-renowned religious statesman, for the development of moderate Islamic thought to promote democratic reform, religious pluralism, multiculturalism and tolerance amongst Muslims both in Indonesia and around the world. 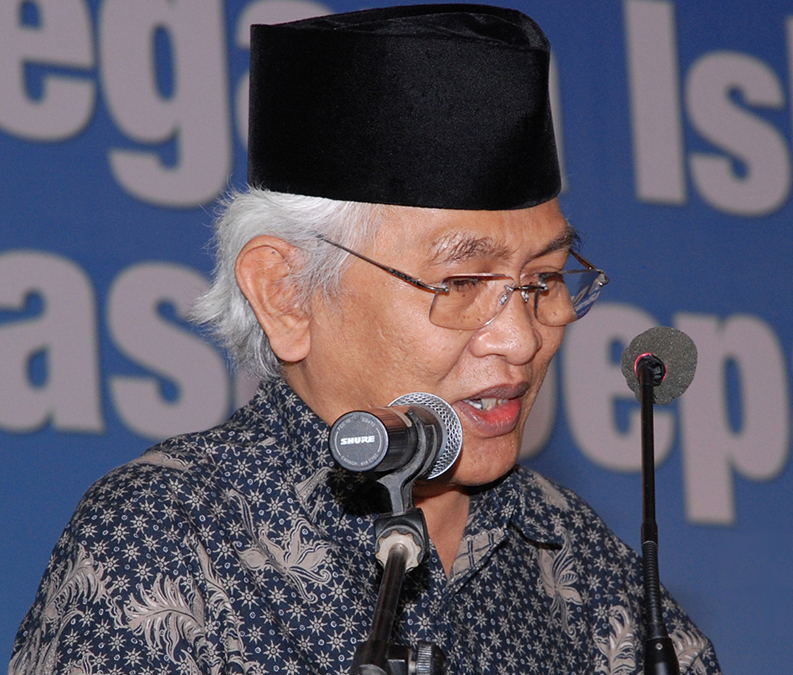 The Maarif Institute for Culture and Humanity was founded by Professor Ahmad Syafii Maarif, former Chairman of the Muhammadiyah, the world’s second-largest Muslim organization, and 2008 recipient of the Ramon Magsaysay Award (often considered Asia’s Nobel Prize). The Institute is committed to promoting the values of Islam, humanity, and keindonesiaan (Indonesianness), which have been the most important concerns of Dr. Maarif, throughout his intellectual and activist life. The Maarif Institute is an inseparable part of the reform movement of Islamic thought in Indonesia, and addresses the growing complexity of humanity’s problems that requires a new understanding of Islamic teachings on issues such as democracy, human rights, pluralism, gender, interfaith and civilizational dialogue.